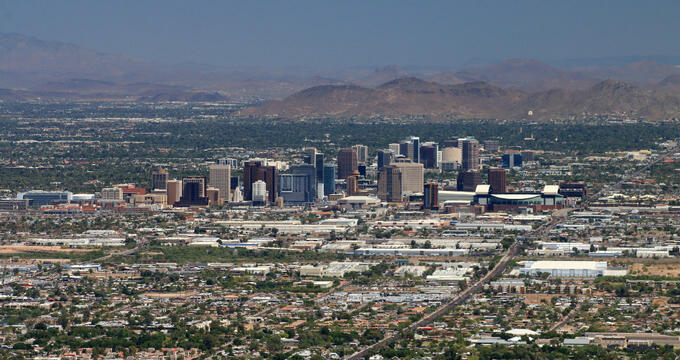 Phoenix is both the biggest and most populous city in the state of Arizona, as well as being the state’s capital city. With over 1.6 million residents, Phoenix is the fifth most populous city in the entire US and actually the most populous state capital of them all. It sits in the Phoenix metropolitan area in Maricopa County, Arizona, and is known as the Valley of the Sun or simply 'The Valley' to locals. Settled way back in 1867, Phoenix is located at the confluence between two rivers: the Salt River and the Gila River, with the latter being one of the major tributaries of the Colorado River. Phoenix is also home to its own mountain range, with the Phoenix Mountain Preserve mountains located in and around the Phoenix city limits. With such a rich array of landscapes to enjoy, outdoor activities and ecotourism are very popular in the city of Phoenix, with climbers, hikers, kayakers, and more finding a lot to do in this Arizona location. As well as natural attractions and activities, Phoenix is well known for its dry and warm desert climate, attractive cityscape, and thriving performing arts sector. There are plenty of live shows of all kinds, from live music to dance and theater, to be enjoyed in the city, which is also home to a very strong economy and many unique historical locations and monuments. The elevation of a city tells us how high it is when compared to sea level. Phoenix, as previously mentioned, is nicknamed the Valley of the Sun due to its valley location and is therefore quite a flat region, apart from the surrounding mountains, meaning that it shares the same elevation as many other cities in the Greater Phoenix area and beyond. The elevation of Phoenix, AZ is 1,086 feet (331 m). Due to its many mountains, the state of Arizona actually has one of the highest average elevations of the entire US, with an average of 4,100 feet (1250 m). Therefore, when we compare the elevation of Phoenix, AZ with the mean elevation in the rest of the state, it's easy to see that the state's capital is actually one of its lowest points and is lower than other major Arizona cities like Tucson, which has an elevation of 2388 feet (728 m) or even Phoenix's neighboring city of Mesa, which has a mean elevation of 1243 feet (379 m). The highest point in all of Arizona is Humphreys Peak, which reaches a height of 12,633 feet (3,851 m) in total and is located in the Kachina Peaks Wilderness part of the state, not far from the city of Flagstaff. The highest point in the city of Phoenix, AZ, is Camelback Mountain, which is one of the most recognizable natural landmarks in the entire Phoenix area and measures up at 2,706 feet (825 m) at its highest point. Other high points in Phoenix, AZ include Piestewa Peak which reaches a height of 2,608 feet (795 m) and Mummy Mountain which has a peak 2260 feet (689 m) above sea level. Phoenix has a hot desert climate with very long, hot, dry summers and short winters with mild temperatures in general. The city earned its nickname of 'Valley of the Sun' due to the fact that it's located in one of the parts of the world that sees more sunlight than almost any other place, with around 3,872 hours of sunshine each year, which is the highest amount of any major city on the planet. Phoenix also has the highest average daily temperatures in the entire US, with over 100 days a year having temperatures of 100°F. Precipitation in this area is typically low for a desert region, with around 8 inches of rainfall each year. The wettest month of the year is July, while the driest is June. Due to its warm climate, near-constant sunshine, and beautiful natural scenery, Phoenix is a very popular tourist spot at all times of the year. Outdoor activities like kayaking and climbing are popular in Arizona's capital, with areas like Papago Park and Camelback Mountain proving popular with outdoor enthusiasts, while the city itself hosts man-made attractions like Phoenix Zoo, Roosevelt Row, the Phoenix Art Museum, and the Musical Instrument Museum. In short, no matter whether you want to stay in the city and relax or get outdoors and be active, there are plenty of things to do in Phoenix, AZ.